U. S. food and beverage manufacturers have teamed up to develop and implement the "Nutrition Keys" Program, a voluntary labeling system. Spearheaded by the Grocery Manufacturers Association and the Food Marketing Institute, the Program places helpful nutrition info on the front of packages. Best of all, it's easy to read! The Nutrition Keys Program was developed in response to a request from First Lady Michelle Obama in March of last year, asking the food industry to develop an easy, front-of-pack labeling system to help busy consumers, especially parents. “We share First Lady Michelle Obama’s goal of solving childhood obesity within a generation,” said Pamela G. Bailey, President and Chief Executive Officer of the Grocery Manufacturers Association. “Today’s announcement would not have been possible without her leadership." 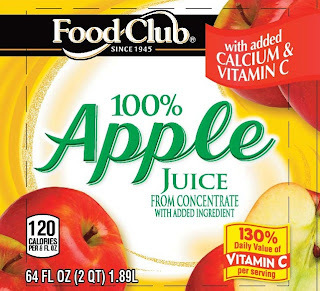 Nutrition Keys will change the look of most food and beverage products by placing important nutrition information (calories, saturated fat, sodium and total sugars content) on the front of packages. To appeal to busy consumers, the information will be presented in a fact-based, simple and easy-to-use format. The basic icons will inform consumers about how the key nutrients in each product fit into a balanced and healthy diet as part of the federal government’s daily dietary advice. On small food packages with not enough space for the basic icons, one icon may be used. representing calories in a serving of the food (for an example, look at the top photo). You'll begin to see the Nutrition Keys Program on food/beverage products over the next several months. The Program has quickly drawn criticism from nutrition experts and others, who point out that foodmakers are trying to preempt the packaging guidelines developed by the Food and Drug Administration. However, those detailed nutrition labels are mandatory, and will remain on packages. I'll doubtless continue studying those detailed labels when making decisions--but for people who never bothered to do so, the new icons may be a step in the right direction. Seafood Watch on your Apple device—for free!